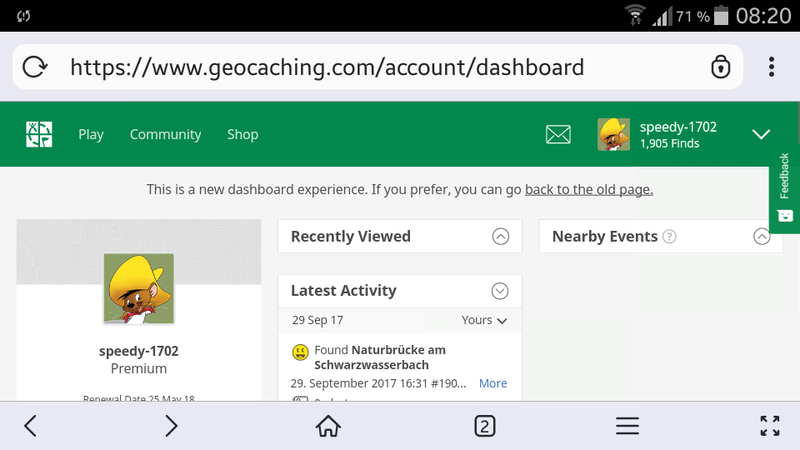 Today’s release includes changes to the Recently Viewed and Latest Activity sections on Geocaching.com’s updated Dashboard. Logs on the Recent Activity feed will now include an optional expanded view that includes log text, GC or TB code, Favorite points, pictures, and location. 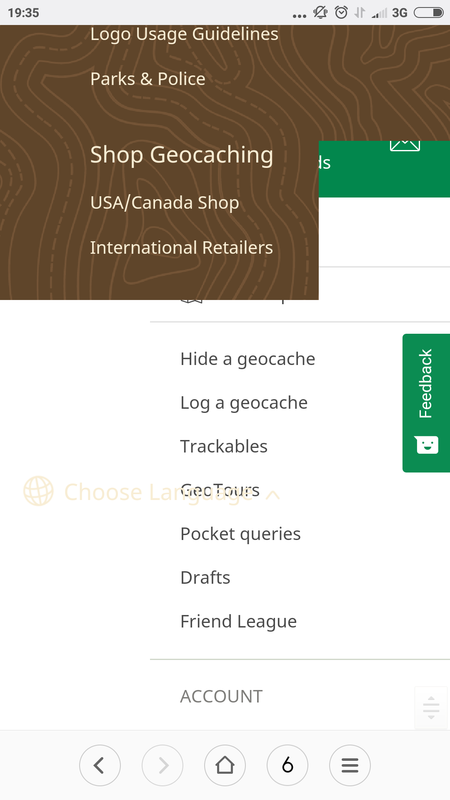 If you have a friend who finds A LOT of geocaches, you’ll be happy to hear that if they post more than 5 logs in a day their logs will now be grouped by log type and collapsed. This will give your other friends a chance to appear in your newsfeed. We’re especially excited to release this new functionality on the Latest Activity feed: Cache owners now have the option to view logs and pictures on caches they own. Even more exciting they will see when their cache earned a Favorite point. We hope this will improve the experience for cache owners as they’ll now be able to learn about the status of their caches and get the recognition they deserve all in one place. Jayme H. (Jayme H) and Dave W. (HiddenGnome) from HQ’s Product and Web Team are watching this thread to answer questions whenever possible. Well, at least the link in the latest activity list goes to the cache now instead of the log, something people have been asking for since day one. I only use the latest activity list to look at my own logs, and I already know what they say, so putting the text of the log in my list is just wasted space. This just reinforces my feeling that there are two entirely different features here -- listing my own logs vs listing other people's logs -- that would be better supported if each had its own presentation instead of treating them both the same way. Great improvement!! Thanks very much. Better look, better organization, and best of all - adding the option to select your own caches. Great work! A small bug I found. For trackable logs it says +9 other caches, when it should say trackables. Thanks for the report Sherminator! We just pushed an update that resolved that bug and added additional translations for the new content. The single most important missing feature, in my opinion, is the ability to select the friends whose activity I want to follow. The Mary Hyde promotion encouraged us to expand our friends list, so now I have friends whose activity I want to follow and those whose activity I dont. Please make this selectable by friend. I just noticed this option today. This is extremely helpful. I had been switching back and forth between the old and new dashboard views, but I think I'm sold on the new view. But please don't forget about the layout logic. 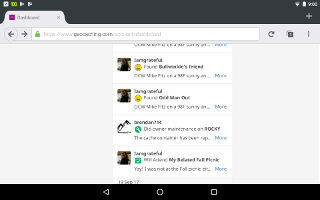 It's quite pessimal on my Nexus 7 tablet with standard Firefox. In my usual portrait mode I get no Activity feed at all, just a bunch of blank space. So I have to switch to auto-rotate, flip it horizontal, and scroll through miles and miles of activity stuff that's far narrower than it needs to be. PS, even cache pages, and most others on the site, show up just fine in portrait mode. Sure, it's small text, it has to be for the page to fit, but there's a standard finger dance to make that bigger. Why can't the Dashboard work the same way? But wouldn't this feature allowing owners to view logs about their cache be even more useful if it was something you could just go to without changing your dashboard settings? I agree it's a cool feature, but it's not what I want to see every time I go to my geocaching home page. 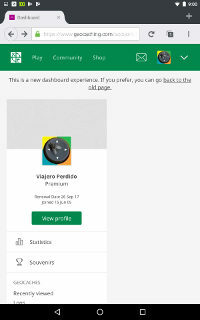 I was talking about opting back in to the new dashboard view vice opting out and keeping the classic "my profile" view. As far as changing the drop-down menu, I don't view it as a hassle to choose among my caches, my finds, or my friends' feed, so I'm fine with it as is. I have a number of FB friends that I do not follow because they were spamming my FB feed. A similar "still friends but not following" state could be useful for geocaching.com too, especially if one has GC friends who strongly favor cache types that one is not at all interested in. The new dashboard is just useless on my smartphone. All I can see are the menus. No content. When I scroll down the page, the background image takes like forever to load and that leads to strange artifacts. Pity, the new functionalities looked good on papier. I might give it another chance when it's working. Like most of it except the LIST section. My Favorite list is too long and it comes up first so it takes forever to go through it and still missing the Watchlist. Should separate the list to close until you chose which list you want to see. For me Favorites is NOT my top list I want to view. In the "Yours" view, each log now takes up even more space than before, further reducing the number that are visible at one time. I'd prefer to be able to disable this additional text, since I already know what I wrote and don't need to see it again. I was under the impression that photos would be shown, but I don't see any in the "Yours" view. Bug or intentional? It doesn't seem like I have any recent photos on my owned caches, so I can't test that section to see if it has the same problem. In "Yours" view, when I click one of the "More" links, the content of the log doesn't wrap. It just stays on one line and disappears to the right. Therefore, the only "more" information I get is the GC code and the location (ie. state/province, country). Further, there isn't anything indicating that an expanded record can be collapsed again. A "Less" link would be a good idea, because it isn't obvious that clicking the record again will collapse it. When changing the view modes, occasionally the label for that dropdown disappears after the view changes. 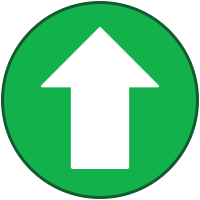 Clicking the still-visible arrow restores the label. I haven't been able to find a pattern that determines when it disappears and when it doesn't. How many records are shown on the "Your Hides"/"Owner" view? I currently have 21 showing. Is it a set number, the last week, etc.? This would be good to mention in the view drop-down descriptions, like "Show the last week of activity on caches you own". Separate log type and cache type icons - it's still impossible for me to scan down the list of my logs and identify those of a certain cache type. FWIW, the above observations were made in IE11. I haven't had a chance to test in any other browsers yet. Thanks for the in-depth write-up! We'll take a closer look to see what is going on with the issues that you brought up, but I can confirm that the wrapping of log text in IE11 is definitely not working correctly. We are not capping the number of logs to a specific number. "Your" logs will display the last 30 days, "Community" and "Owner" includes the last 7 days. In a normal, mobile-responsive layout with a main column and a sidebar you might include the sidebar in the flyout (hamburger) style menu with the main column as the focus of the mobile responsive view. However, when we started building the Dashboard our mobile responsive menu already included the site navigation so we did not have a place to put the sidebar content. We also did not have control over the contents of the menu so we had to decide how to display the sidebar and the main column content. We made the decision to make the sidebar content available in order to provide access to the other gameplay specific pages (My logs, My trackables, etc), but that meant that the main activity content is not displayed when in the mobile responsive view. This is not an ideal experience when viewing the dashboard on a mobile device if you want to see the activity. We are hoping that future changes to the site header will provide more flexibility so we can revisit how/what is displayed on the dashboard when viewing the site in a mobile responsive view. OK, at least I know. Thanks for the reply. I tried on my computer and it looked good. I still don't know how I will be notified of the PF. I hope I'll soon find out. I noticed that my archived logs (owner maintenance in the present case) still show up in the activities list. Is that on purpose ? Thanks for the response. I just tried things in Firefox, and it looks much better with text wrapping and I can now see that there's indeed a "Less" link. Still no photos in "Yours" view, though. Is that intended? ...is displayed as the four raw characters above, rather than being replaced with an image of a smiley face. I'm just saying the list of logs for my caches strikes me as an independent feature, not something that has anything to do with what I want to see when I go to the dashboard. I'd like to call it up explicitly without changing how my dashboard will behave next time I go back to it. I'll check with the team about the photos in Your logs. I want to say that is intended to be displayed, but I can't recall the exact requirements for that view at the moment. The rendering of smileys and Markdown is not currently supported in the dashboard rendering. It got a little tricky with the collapsed vs expanded views and how to handle smileys or Markdown that are at the character limit in the collapsed view and then changing the view when expanding the text. We are tracking feedback on the log text to gauge how it is being used and whether the extra rendering is missed. I understand that you would like to see Owner Logs as a standalone feature. However, my team is currently focused on continuing to make improvements to the Dashboard so we took the opportunity to add in a nice bonus for cache owners. Hopefully we can expand on the functionality, but until then please enjoy this nice new feature on the Dashboard that wouldn't have existed otherwise. Hopefully we can expand on the functionality, but until then please enjoy this nice new feature on the Dashboard that wouldn't have existed otherwise. Thanks for the kind offer, but I prefer the old profile page, so I'll have to live without it. Log grouping: thank you very much for this. I have a friend that keeps flooding my Recent activity list with 20 logs every other day. :-) This helps a lot, at least until we are allowed to choose particular friends we would like to follow. Just one thing: how about to make the group threshold adjustable in Preferences? I would like to try increasing it, maybe to 7 or 10. That would still effectively filter out numbers-hounds. Maybe I would then figure out that it would be better to return to 5, I don't know. But why not make it tunable (within some limits). Too many things are hard-wired. Optional expanded view of logs: another great thing and pleasant surprise. Makes sharing my adventures with friends much more convenient. I appreciate that images are displayed as well below the log. And finally we can see the type, GC code and region of the cache. But I would prefer to see this info in the main view, at least the cache type. Your hides feed: max age of the logs displayed here? I can only see two logs in there, so I assume 7 days. I wouldn't mind to set it up to 30 days for me. But other users with tens of caches might be satisfied with the current setting. Again, this could be adjustable per user as well. But a major flaw of the Community feed still persists and it's going to be even more visible now after the feed started displaying log contents: some of my friends' logs never make it to the feed. It happens when a friend has logged older finds. Usually they're no more than 1 month delayed but a few days ago a friend of mine logged three months old finds. :-) I cannot push anyone to instant logging as they might be busy with family, work, etc. but their old logs just do not show up in the feed. For the log limiting, a load-more option would really help. I too went to the list to see only 5 or 6 logs, but no option to see any more. Even if it limits to say 2 months max while the initial load only pulls 1 week; or 100 logs max where initially it loads 20. Date limiting though is more problematic since that could mean 100 logs in the last 7 days, or just 1 log. Limiting by log count is better, imo, especially for server load since the request is by quantity of data, not pulling everything within a date range. One other thing about the Lists. As you see because I mention this a lot, that I use it a lot. As you view lists (Bookmark Lists) where do you create a new one? On the old Bookmarks you can easily see it at the top and create a new one. The new lists you can only seem to do it from a cache page. If I am wrong can someone tell me where on the List Page you see where you can? Although this doesn't really have to do with the Dashboard, I totally agree. I want to be able to create a new list from the My Lists page. Sounds like your friends' issue and not the dashboard's. It would take far too long for the dashboard to load the past couple months' activities just to accommodate late loggers, and I don't think it's a valuable use of resources for Groundspeak to reprogram the dashboard (again) just so we can track the tardy. In other words, if my friends are concerned about showing up in my feed, the onus is on them to log on time. What you are asking for is to order the activity based on the create date instead of the log date in order to see the activity when it is added instead of when it was reported to have taken place. Sorting by create date was how the activity feeds were launched and as I recall there was a lot of push back. I can completely understand why you would want to see the activity based on create date, but there is a good argument for using the log date as well. At this point you are probably thinking "just make is configurable so we can decide", which is a wonderful idea. Other websites like Facebook allow you to configure your experience with an unending number of options and filters which might set an expectation when interacting with similar features on other websites. Unfortunately, that kind of customization is not simple to develop and even Facebook started with a very barebones version of what we see today. I would love to add more customization and filters and I could tell you that we'll get to it soon, but based on our development backlog it is not going to happen this year (including the ability to choose which friends to display). You're right, HiddenGnome. I really liked activity ordering based on the create date when the new dashboard was introduced. It was so convenient to check out the top of the feed when I signed in to find out whether my friends had been caching and what they had posted. I always remembered the feed's last log so I could be sure that the new unread logs were above it and that they were not mixed with the already read ones below. And that they were not dropped. It was actually similar to e-mail notifications which come one after another as they are created. Thank you for a hope that an option to set create date ordering could be returned one day and thank you as well for all your work and feedback. I very much agree. For me the "last 15-30 logs" would be far more useful than "all logs from the last 7-30 days"
The activity feed stopped working for me when I switched to showing activity from my friends. And now there's no way to switch back. I just get "We couldn't load latest activity. Refresh page to try again." I'm guessing that I have too many friends, and/or too active friends, so there's too much data to load. It is indeed because you have a lot of friends - which is great! Ben and I have the same problem and haven't been able to access our feed since the changes were made last week. We knew that there were most likely others out there experiencing this bug, but there weren't many at HQ. We got lucky that it just happened to affect the (super social!) Product Manager for the Dashboard project, as the team has been aware and has been working on a fix for this. It should (hopefully) be released today! Awesome! Other than this, I really like the recent changes! It should be working for you now. It will be slower on the 1st load, but once it is cached it should load quicker. Thanks for the more/less feedback, we'll run it by our Product Designer. It's working again now, thanks! I actually prefer to just have the text always expanded for all logs, and have added that to my user script. Maybe this should be added as a user setting (sometime next year)? Cache owners now have the option to view logs and pictures on caches they own. Where can I find this option? Please provide detailed step-by-step information. On the Dashboard under Community choose "Your Hides"
I have just noticed that the Dashboard does not display images under expanded TB logs. There is a bug that is pointing the request for the TB log images to the endpoint that handles the geocache log images. We are currently testing an update to fix this issue. Interesting, and where can I find the community drop-down list? Click the "Yours v" dropdown in the "Latest Activity" box and choose "Community"
Until you had trouble, it didn't occur to me that that drop-down is impossible to find unless you already know about it. It doesn't even look like a drop-down, really, and even if you think it's a drop-down, the "Yours" tag doesn't really suggest what it's a drop-down for. Theres one little but BIG thing im still missing. I want to see the cachetype of my find without having to expand the log itself. +1 Perhaps the cache type icon could be placed before (or after) the bolded cache name? Any update on fixing the missing TB log images? I appreciate being able to see the log text and seeing the fave point icon and photos is helpful. Helps me double-check that I haven't missed something in my logging. I like that it's collapsed, but not thrilled with the behavior when clicking on the grouped "+x caches" text (I don't remember the exact text and right now none of my Friends has that much activity). I was thinking that clicking on that bolded section would show me the details for the grouped/collapsed activity, but instead it just takes me to the same finds history that I can get to from their public profile. That history isn't limited to the specific date and I can't see their log text without opening each cache page and scrolling to the logs section. It would be great if clicking on that collapsed text area would open another window/page that shows the same detail as is shown for non-collapsed activity, including their finds and dnf's.